*Design features and specifications are subject to change. Please consult factories for updates. BENDPAK® and RANGER PRODUCTS® are registered trademarks of BendPak Inc. The BendPak MD​-6XP mid-rise lift has long topped the most-wanted list for auto professionals and DIY'ers alike. They’re excellent for home use because they fit in low-ceiling garages, but auto detailers, custom shops and repair bays alike find use for them. After exhaustively reviewing the merits of both BendPak and off-brand lift mid-rise car lifts, the BendPak team released the following report. In it, critical design features are compared. We hope this is an eye-opening experience for you. Established lift manufacturing companies will proudly place their brand name on their product. Unfortunately, many lift “brands” are just labels fabricated by dealers supplying these products as their own. If you find an auto lift that interests you, be sure to search for an informative and detailed manufacturing company website, or at least a brochure. Also check to see if there are multiple dealers offering the same brand for sale. Some dealers may bill themselves as exclusive suppliers, but only for a brand that they created. If you can’t find solid, verifiable information relating to the actual manufacturer of any given automotive lift, or if only a very limited number of dealers even sell the lift, you are probably best off searching for alternative options. But when you think about the true meaning of value, two primary things should be considered. (1) How much you’re paying and (2) what you’re getting for that amount. Discount lift retailers want you to forget about the second part of the equation. They claim to provide the best value, but they are only providing you the best price. Business owners know that they need to consider the overall cost of the automotive lift throughout its entire life of service. The checklist is slightly different for home users who don’t plan on earning revenue off of the purchase. For them, saving a couple hundred bucks can still mean the difference between enjoying time in the garage and having a total service nightmare. While an expensive car lift will not always mean high-quality materials, an exceptionally low-priced automotive lift will almost certainly be cheaply made. That means no engineering to speak of, compromised safety systems and thinner steel. These are the kinds of things that can cost a business owner untold thousands of dollars in damage or downtime. Car enthusiasts are willing to spend thousands of dollars on their beautiful automobiles, but they senselessly cut corners on the very thing that holds the cars up. There’s nothing wrong with shopping around for a good price, but make sure you are willing to at least pay for the value you hope to get out of your new car lift. At BendPak, we believe the customer should always get what he or she wants. The best way to do that is for the customer to have all the information available. However, it’s difficult for the average consumer to do their own lift comparison, particularly when the true manufacturer of many lifts is kept secret by the reseller. We purchased one of the most popular no-name lifts on the market today, the Tuxedo. Tuxedo supplies imported car lifts to many different companies, who in turn market them under many different names and model numbers throughout North America. Check out this side-by-side comparison and determine for yourself which company offers the better value. 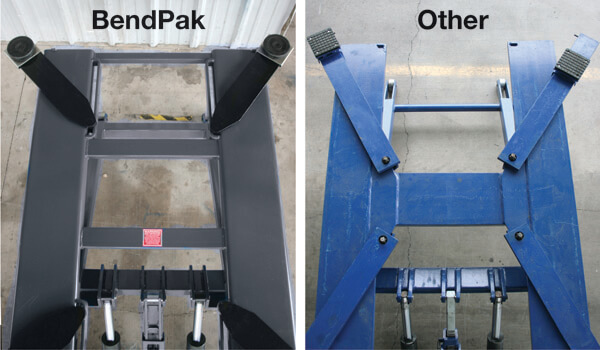 Top-side comparison of BendPak mid-rise lift vs. competition. Compare design integrity of power units. BendPak features cleaner, thicker wiring. Full grip on pad stoppers vs. only partial wrap on value brand. Cleaner, superior welds on BendPak arm pad undersides. Circular pads offer same width as square pads, as well as a better hold. 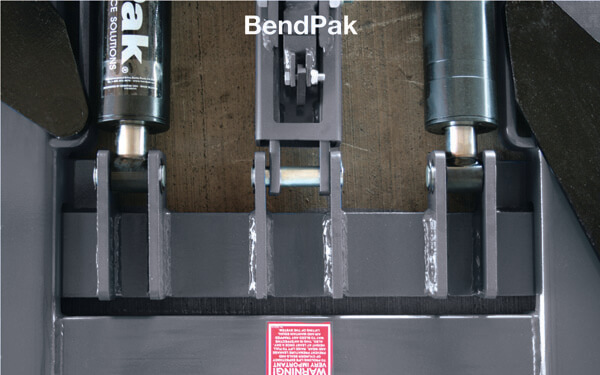 BendPak extended pads don't warp over time, and last longer than thin square pads. Value brand's pad does not rise above screw. Will pose problems during some lifting applications. 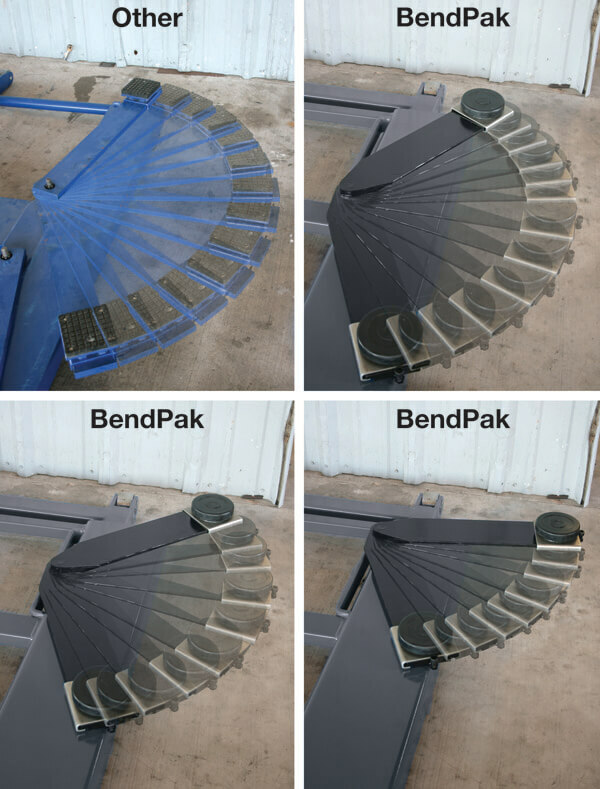 BendPak arm is wider, more durable. Clear view of BendPak's arm width for increased support. Wider center lock bars improve lock integrity and structural support. 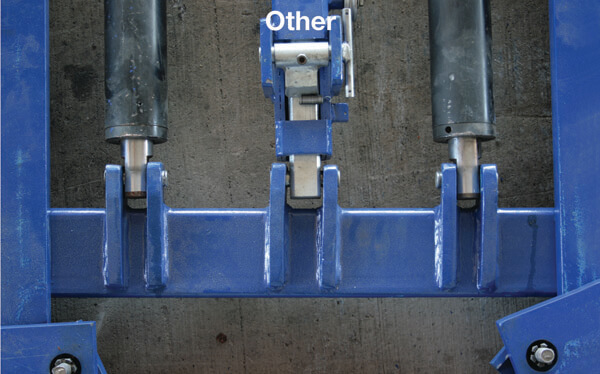 Dual welded pivots and thicker lock bar only seen on the BendPak mid-rise lift. "Other" brand's lock assembly appears rickety in comparison to BendPak. BendPak features automatic, hands-free safety lock. Value brand requires manual hand release for safety lock. BendPak's cylinder is significantly more robust than other brand's. Protective & convenient hose attachments not available on value brand. Wider cross bars increase lifespan of the lift and improve safety, reliability during use. Highly developed and overengineered for user safety and product longevity. 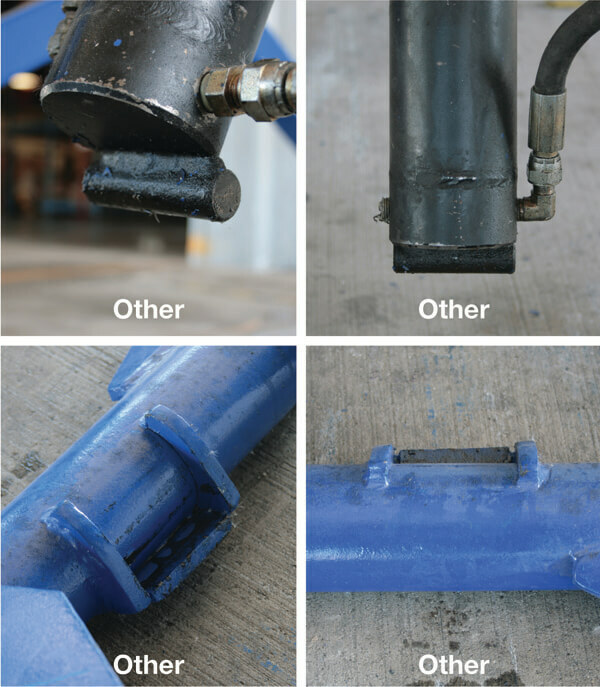 Cylinder attachments are smaller, higher maintenance over time. Torsion bar design on BendPak. Compare size and quality of torsion bar design to BendPak. Rugged cylinder attachments nowhere to be found on value brand. Notice weaker, less skillful welds and cylinder attachments. Base tubing on BendPak prevents contamination, rust. 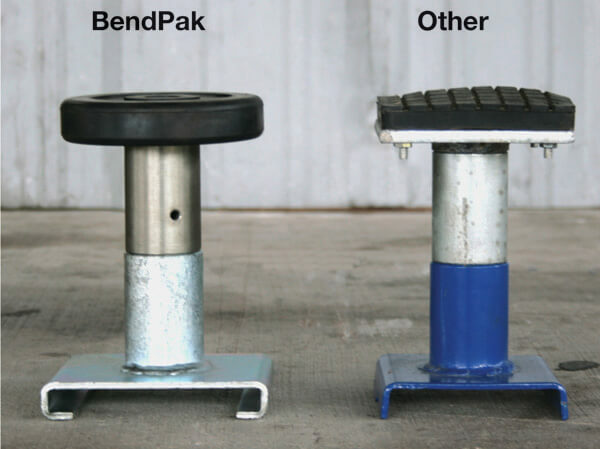 Compare BendPak's superior welding on leg pivot points. Compare height of full collapsed platforms. Better engineering can reduce footprint while supplying higher quality materials. Wider footprint on value brand. Thicker, more durable caster featured on BendPak mid-rise lift. BendPak movable arm safely provides increased range of motion, increased access to wheelbases. Value brand pivots at a fixed position for more limited functionality.